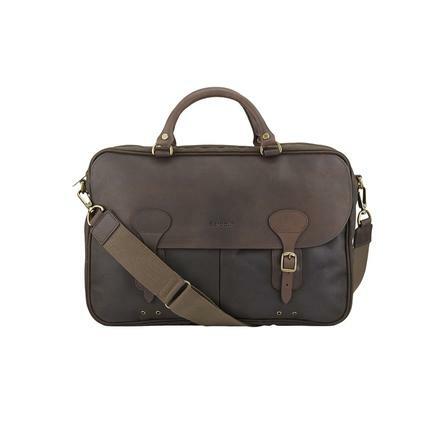 The Barbour Waxed Leather Briefcase is made from 100% cotton. Thornproof and with waxed leather lid, this is a very practical briefcase. Lined with Barbour tartan. Two front bellows pockets. Adjustable cotton webbing shoulder strap and leather handle. 31cm x 43cm x 10cm (12 x 17 x 4 inches). Available in olive green, navy blue or stone. Please make your choice from the pull down menu below.SALE!